Do you enjoy baking? How about painting? Model building? Why not incorporate all of your loves into something amazing (and edible)? This edible airbrush kit will allow you to airbrush food-safe ink onto items of your choice (preferably ones you plan to eat). Use it to paint an accurate rendition of a nebula on a cookie, get the perfect shading on your cake shaped like Hogwarts, or just let your artistic side take over on a white fondant-covered cake. What would you do with an edible airbrush system? I told Inkedibles that my readers are great cooks/entertainers and are crafty, and that they like unique and interesting things to use while cooking/crafting. They offered up one of these amazing airbrush sets in return. Enter to win below and you could win the Edible Airbrush AND the pack of 17 edible inks to go with it! You lucky folks, you. Too impatient to see if you win the contest? You can grab your own airbrush system now from Inkedibles.com. I have more plans with Inkedibles in the future, and they’re going to be a lot of fun! Keep an eye out! I would use this to first experiment and then branch out my decorating skills for my at home pie business! I would love to have one of these for when we create our children’s birthday cakes! I can just imagine how this would amp up my holiday creations…particularly halloween! 🙂 Very nifty. I’d make some custom cookies to send loved ones, some nerdy cookies (thinking Firefly inspired!) for my husband’s birthday in November and maybe I’d get to help out with my nephew’s future birthday cakes! My mom would love this! She goes crazy for cake decorating – especially our Christmas cakes, you could make an amazing one with this! I would love to have this for making my signature French desserts and cakes! So cool! What a great giveaway! Thank you for the opportunity! I’m a stay at home mom, who is always looking for ways to create exciting cakes and goodies! I’d decorate cookies and cakes with it! i would give it to my daughter who absolutely loves to decorate cakes!!!!! Perfect to advance further with cakes, great giveaway! Airbrushing makes people look better. Why not cakes! I would love to try my hand at using an airbrush to decorate cookies with a lace effect. Not to mention adding dimension to gum paste flowers and cakes! The possibilities are endless!!! Cake & cookies & cupcakes….nom nom nom :). Hi Tara ..love your site! 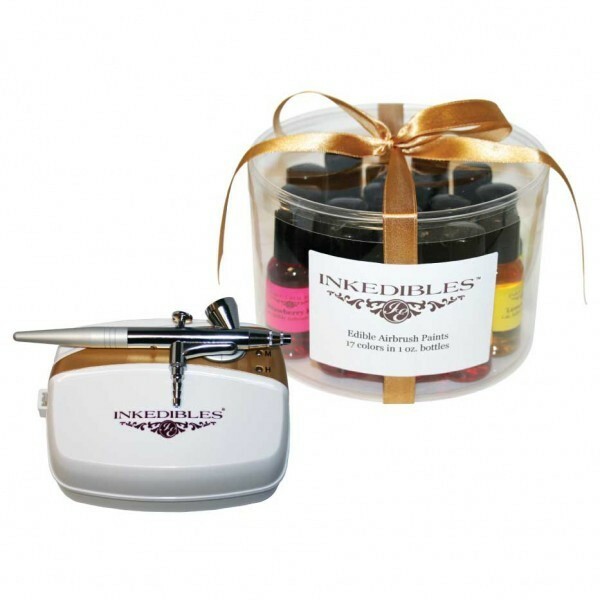 I wanna use the inkedibles airbrush system to turn baked goods into something more magical. Love your site! I like to eat things. This sounds pretty awesome! More cupcake craziness! Do I hear a version of the planets? yumm. I’d love to use this for my custom cakes and cupcakes! ermahgerd! such much nerdy ideas! I wants! I would use this instead of all those little spray cans of edible color. This would make spraying cupcakes and marshmallows soooo much easier!!! I would use this to bring my baking to the next level! 😀 Woohoo! Would love to try airbrushing on my decorated cookies! Thanks for the fun contest!